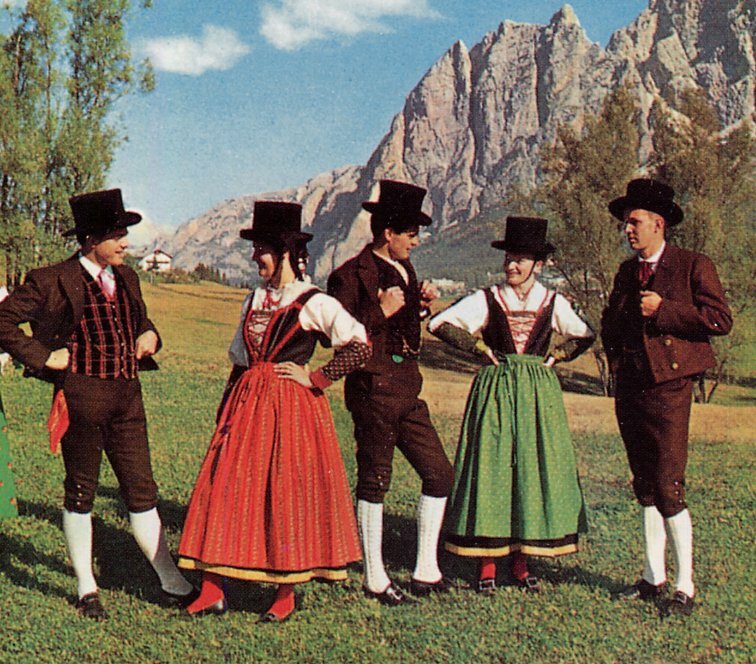 When I did my articles on the costumes of the Rhaetian peoples, I had very little information on the costume of the Ampezzo valley. I have received new information, and so will talk about it now. Cortina d'Ampezzo, in Ladin Anpezo, is in the northwest corner of the province of Belluno in the region of Veneto. 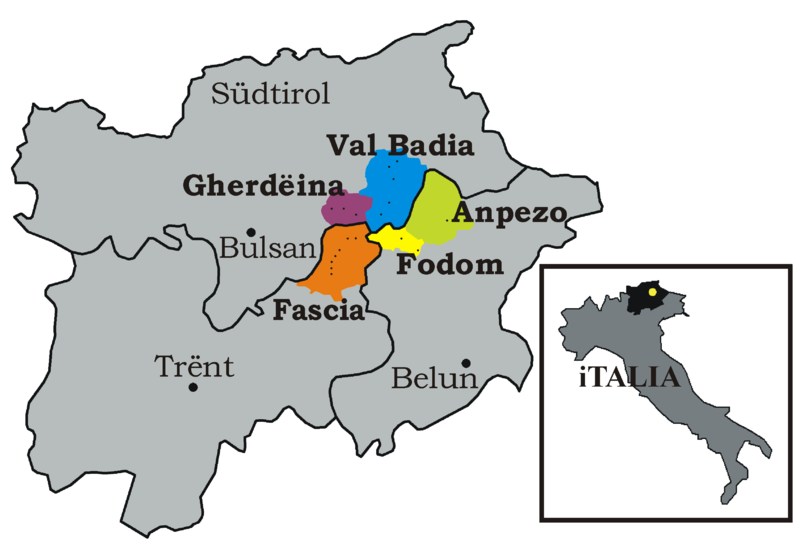 It is one of the five valleys in which the majority of people speak the Ladin language. It is shown in green on this map. 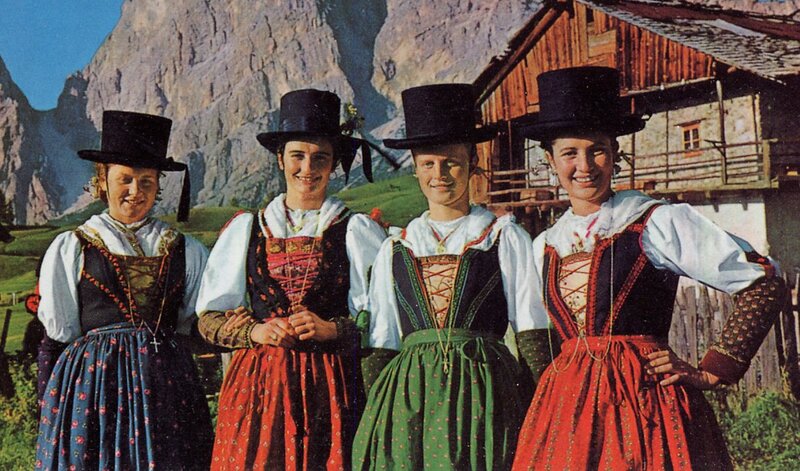 There are four costumes which are currently worn by the women of this valley for special occasions, one of which is a revival of an older style. I will be giving costume terminology in the Ladin language. This means 'the old one'. 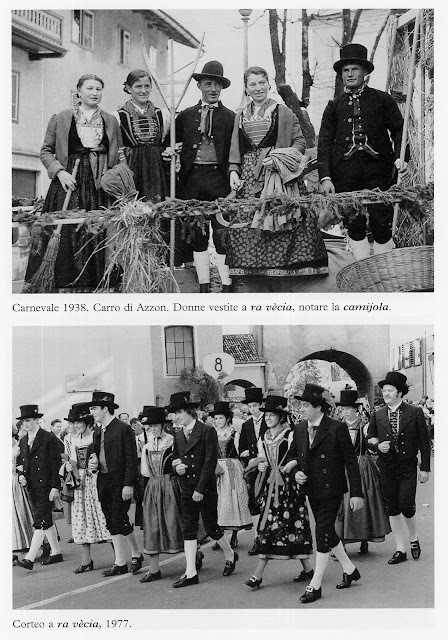 This costume was worn in Anpezo up till the middle of the 19th cent. 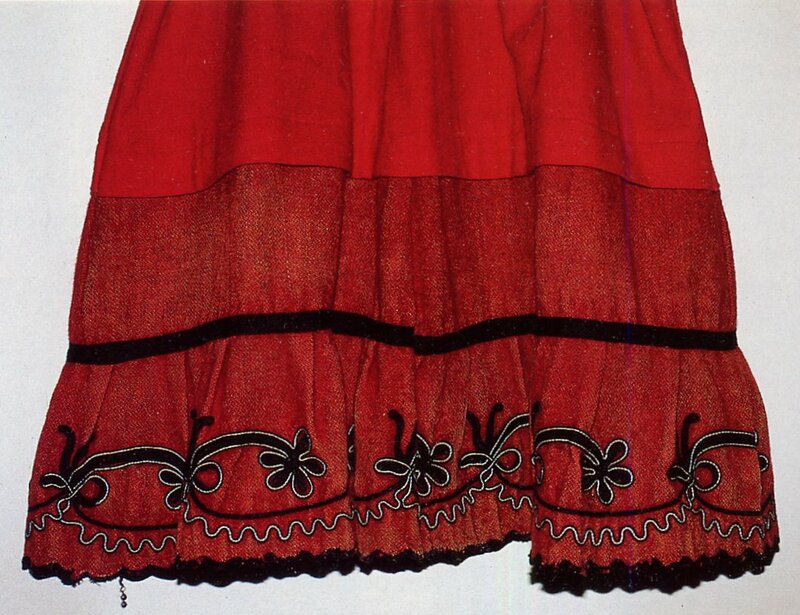 Originally it was worn with a jacket that had large cuffs. The first print shown is from Emma Calderini, and the second one from 'Trachten den Alpenlaender' by Hans von Hammerstein. The second print also shows the bodice, with a necklace and part of the chemise on the hanger. Here is a drawing of how the revived dress is worn today. 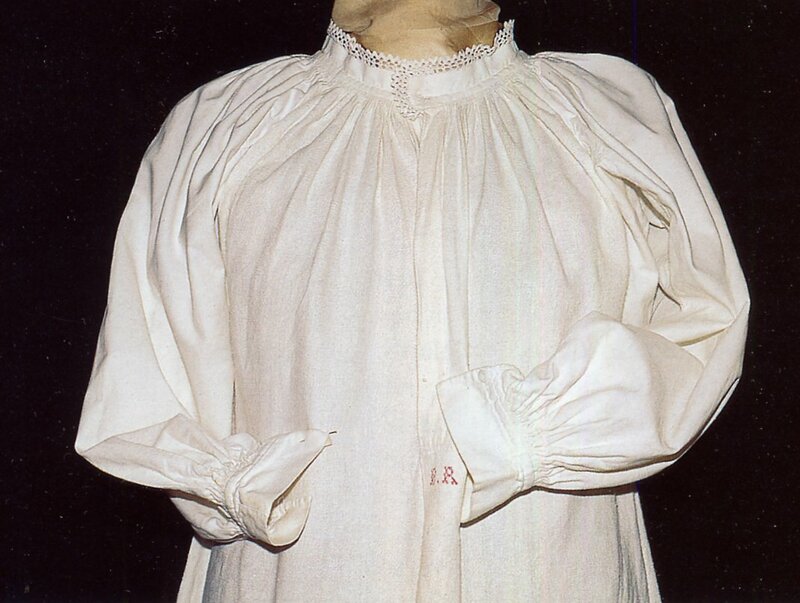 The foundation garment was a chemise of linen with lace around the collar. A petticoat was worn, in winter this would be of red wool flannel. 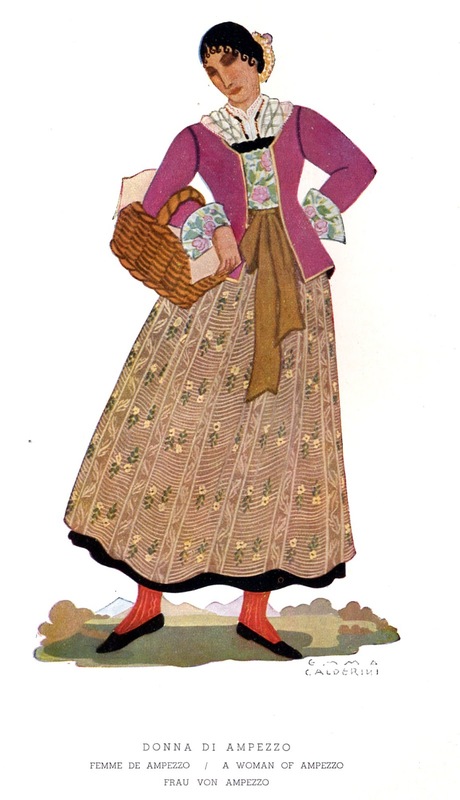 The two prints above seem to show that the skirt and bodice were separate, the skirt being made of black or naturally dark wool, and the bodice of any color, with ribbon or lace trim, and laced up the front. Today the bodice and skirt are sewn together and both are usually black. This garment has survived as part of the newer versions of the costume. 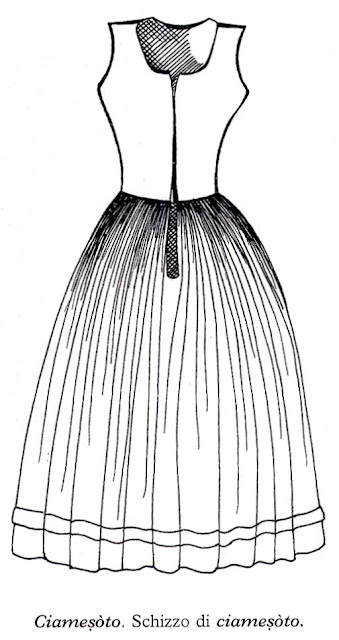 Here is a schematic showing a newer version of the neckline. This garment is called ciamesoto. 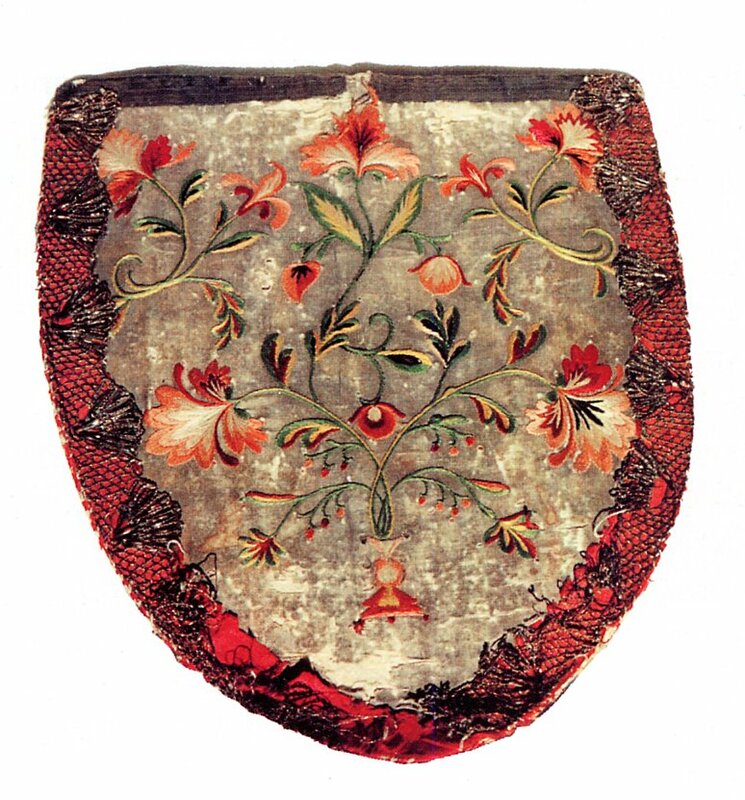 As you can see from the drawings above, an embroidered or brocade plastron was worn under the bodice and was visible behind the lacings. This adds a very elegant and decorative touch. This was stiffened with cardboard or by other means. 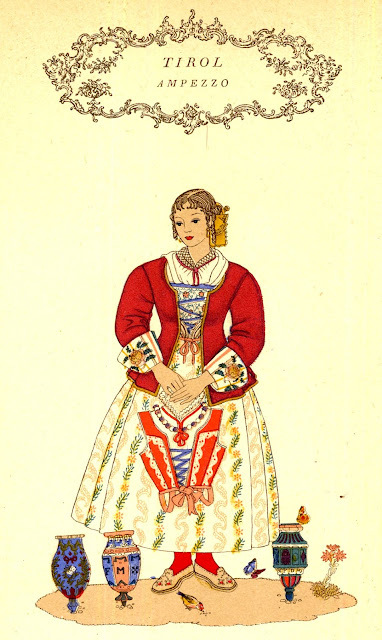 A very full apron of brocade or printed cloth is worn with this costume, The skirt barely shows at the bottom and in the back where the apron almost meets. At this time the apron is tied in front with a ribbon. The skirt today is adorned with a gold galoon. 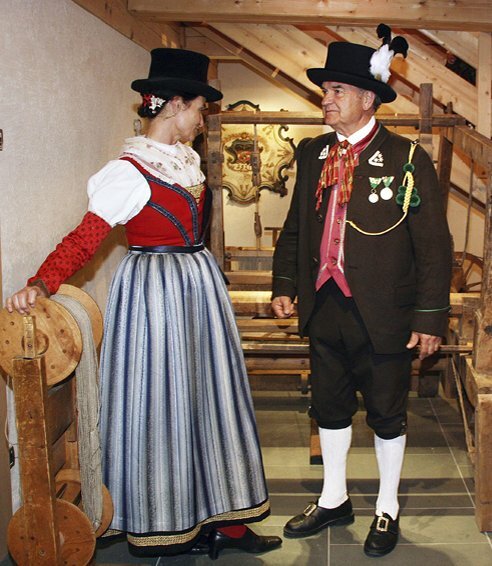 Knit socks and leather shoes with buckles are worn. A fine linen kerchief with embroidered or otherwise ornamented edges is tucked under the stomacher. For daily wear this was replaced with a colored kerchief. When the jacket is not used, decorative oversleeves are worn. 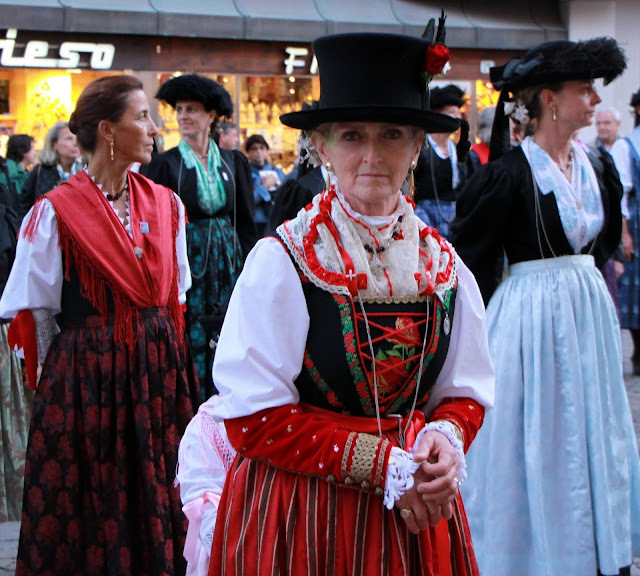 This is a common feature of western European costume. They are often connected to the bodice with a ribbon. The felt hat shows Austrian influence, and is not shown in older drawings or photographs. Silver jewelry is worn, drop earrings, a chain with a cross or medallion, and hair pins. The hair is arranged in braids which are gathered at the nape of the neck. 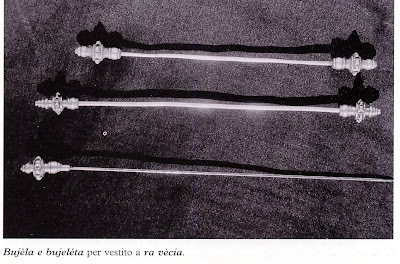 A large hairpin with filligree heads on both ends secures the bun. Above this is inserted another pin with a head on one end. Formerly widows covered the bun with a small linen coif. 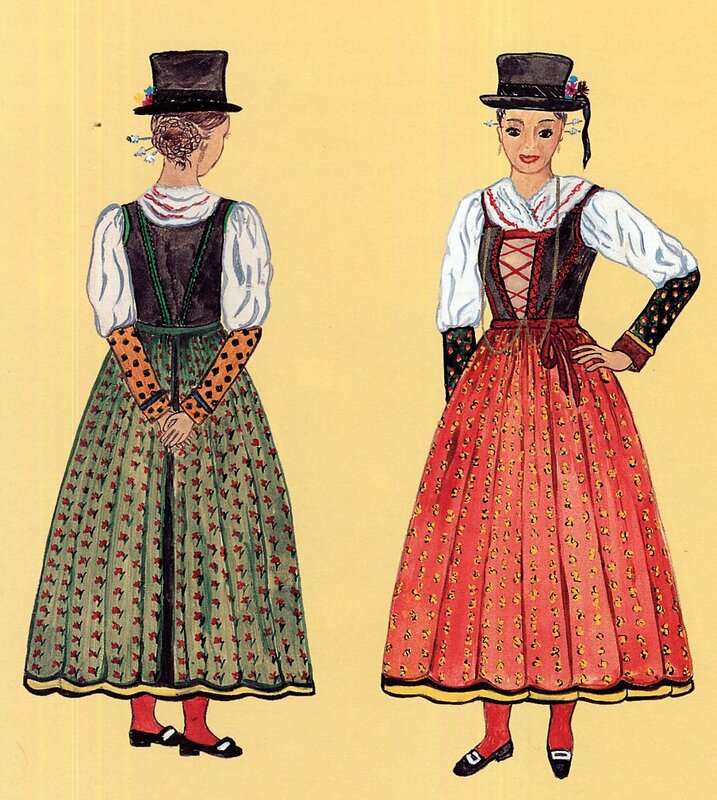 This is a very colorful and graceful costume, and I am glad that it has been revived. 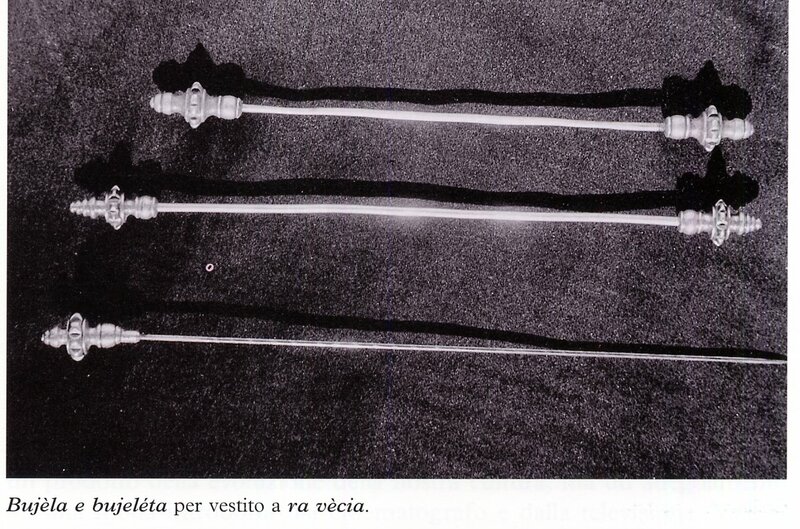 Some more images of ra vècia. 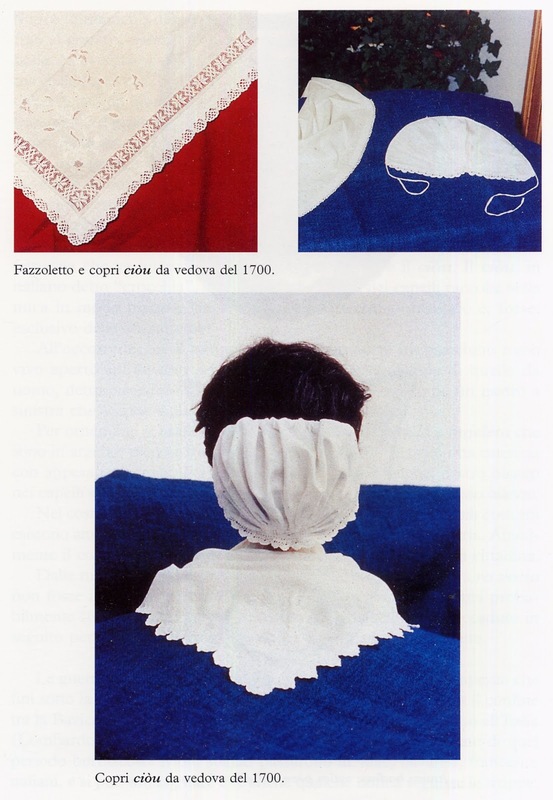 The other three versions of the costume postdate 1850, and I will cover them in another article.